Based in Los Angeles, CUSCINO (pronounced coo • she • no) is a Music Producer, DJ, and Composer for film, TV and video games. Of Italian and German descent, CUSCINO's forward-thinking, euro-influenced music production style is quite literally in his DNA. His debut EP, Eternality, released October 2013 on Fashion Sells Musiq (Los Angeles), provided a first look inside of CUSCINO's progressive, textural approach to music. The EP received praise from MAGNET Magazine, Ad Hoc, and BPM.NY among other press outlets, as well as nationwide support from college radio music directors, landing CUSCINO's debut on the CMJ/NMR Top 40 RPM chart above new releases from electro-vets Cut Copy and Boards of Canada. His sophomore album, set for release in 2016, will highlight the next step in his evolution as an artist and producer. A classically trained guitarist from a young age, CUSCINO's penchant for dark, layered soundscapes stems from an early fascination with Spanish pieces from master players like Segovia. Later influences included Prince, Underworld, Goldie, KMFDM and Massive Attack, which led to the use of pianos, drum machines and turntables in his work. The combination of his early classical influences with these later instrumental sounds created a natural bridge for CUSCINO to create his distinctly textural, human sound across all his work, whether scoring to film or producing music outside of the moving picture. Today, CUSCINO remains steady in his writing, producing and performing, always in pursuit of that experimental-yet-accessible edge. 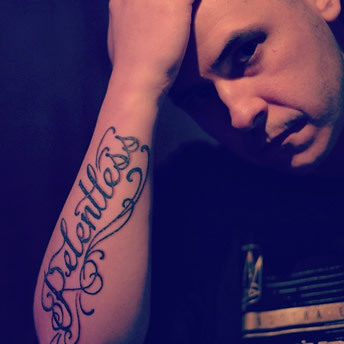 In addition to his work as an artist and producer, he's scored numerous festival-worthy films, featuring lead talent such as Adrienne Lovette (Sunlight, Jr.), Edwin Bravo (Pirates of the Caribbean: At World's End), and hip-hop artist Buddy Lofton (NYC). CUSCINO is dedicated to taking both viewers and listeners on a visceral journey that's filled with rhythmic twists and turns, ambient sound, unforgettable melody, and a distinct sense of forward motion, propelling them full bore into the worlds of sound he creates.